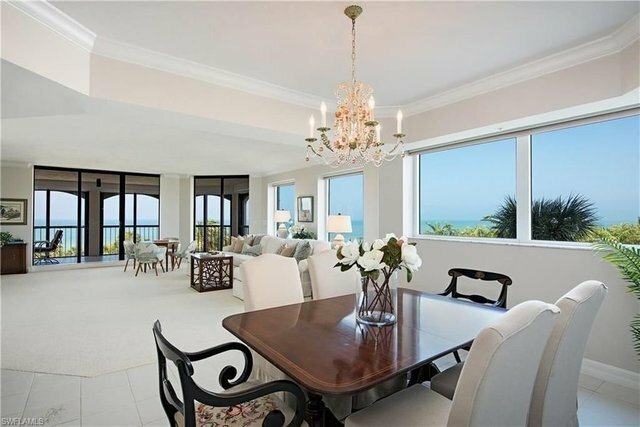 Take note of this graceful, light-filled, Value-Priced Carlysle corner BEACHFRONT Bay Colony JEWEL! Enjoy surprising Westerly Gulf-Front views, complemented by tranquil, wide Easterly garden sanctuary vista views.This special property welcomes you with a generously open and flowing floor plan, new sand-hued carpeting, subtle-soft grey-tone fresh paint, and is offered partially furnished with a cozy blend of antique and transitional seaside furnishings.Enjoy tropical breezes and gazing at turquoise Gulf waters, while curling up with a good book on the dreamy West facing screened lanai, or sip a steaming cup of coffee while observing morning sunrise and bird-life from the second, East facing lanai, accessible from both guest suites.All complemented by the prestige of World Class Bay Colony and Pelican Bay included membership privileges: 3 private Beachfront Dining Clubs located on 2½ miles of pristine sugar white sandy beach, attended Beachfront services, 3 active Tennis Clubs, miles of nature walking & bike paths, state-of-the-art Fitness, Community Lifelong Learning and Wellness Center. Artis Center for Performing Arts, Mercato, and Waterside Shops all just steps away.